3. 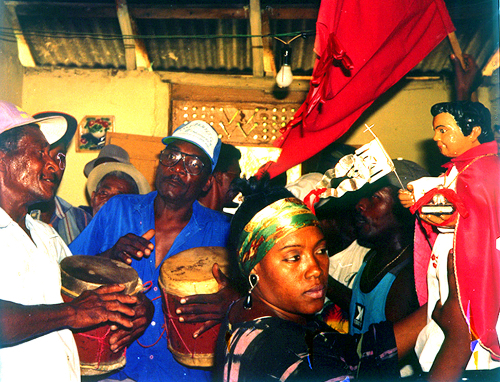 Case Study of an Afro-Dominican Cofradía: The Brotherhood of St. John the Baptist of Baní and its "Sarandunga"
During colonial times, in many places in the Afro-Latin American culture area, particularly urban, the religious brotherhood known as the cofradía served as a mutual-aid and burial society for slaves and freemen (libertos). Most cofradías no longer exist, since, following the abolition of slavery and the rise of modern society in independent republics, blacks have had increasing access to public social services and economic mobility. Yet in the Dominican Republic, some cofradías still remain, living relics of colonial history. 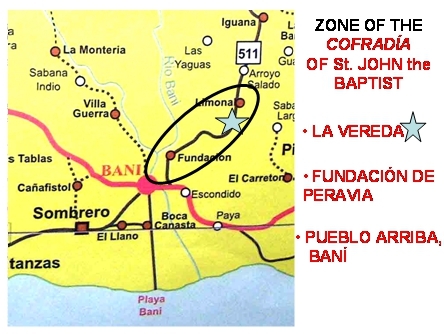 Location of cofradía of St. John the Baptist in Peravia Province (Baní) on political map of Dominican Republic. 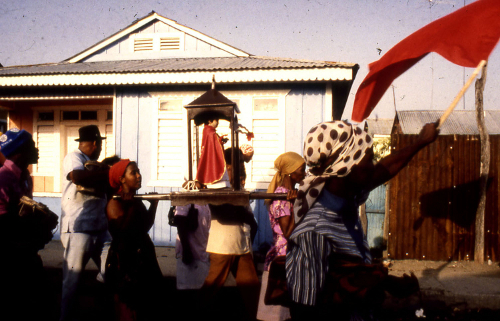 An example is the Afro-Dominican cofradía of St. John the Baptist in the Province of Peravia, better known as Baní. Until recently, the town of Baní—and many towns of the Dominican Republic—was entirely or mostly white, in the case of Baní, largely of Canary-Island origin (1768). The cofradía was located in a black area in what used to be the northern rural outskirts of town on both sides of the Baní River (Pueblo Arriba and Fundación de Peravia), at the home of its head, the capitana, and in the rural community of La Vereda ("the path") (municipality of El Limonal) in the hills some 8 kms northeast of town. This cofradía of Baní is unusual in its devotion to St. John the Baptist, a patron saint largely superseded by Holy Spirit in its counterparts elsewhere throughout the country. However, a strong and ancient devotion to St. John persists in La Maguana, Province of San Juan (interior southwest region), which draws pilgrims from a wide region, although this devotion is not a brotherhood per se. Through Afro-Latin America, as in the Mediterranean and Canary-Island areas, it is widely believed that bodies of fresh water - springs or rivers - are blessed by St. John before dawn on his day. The brotherhood of Baní is unusual in that its founding and lineage of succession is recalled through oral history. The natural urban commercial hub for the Dominican southwest was not Santo Domingo, rather Port-au-Prince, Haiti. Perhaps it was when the island was unified under Haitian rule (1822-44) that, according to oral history, a man named Piobisco Martínez bought the image of St. John and his drums in Port-au-Prince. Martínez paid a pesa of cattle, which is 25 pairs (mancornas), that is 50 head of cattle. Upon his death, the devotion was inherited by his mother, called “capitana;” then this leadership role was passed to her eldest daughter down to the current day, with certain adjustments for circumstances. The former social organization was much more complex than it is today, and the brotherhood larger and more prosperous. The festival season entails three celebrations: on the eve and formerly the day of St. John (June 23-24) in the folk-chapel of the saint; during the day of St. Peter (June 29th) in Fundación de Peravia; and during the day of the second or third Saturday in July in La Vereda. During the year, a number of other fiestas can be played for devotees' personal rituals, such as in payment of a personal vow for healing, or to baptize a house. The cofradía of St. John the Baptist in procession with the banner and the saint, singing and playing the morano. The festival on the eve of the saint is the most important. 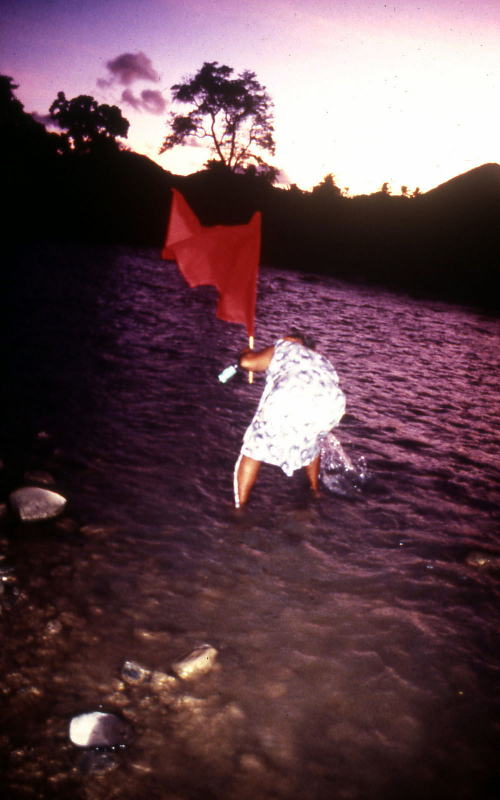 It is culminated just before dawn with a procession with banner, saint, and drums, to the Baní River. When St. John’s red banner touches the water, it is blessed for the day. The faithful jump into the river or fill bottles with the holy water. Then the brotherhood “visits the brothers” on its way back to its chapel, playing three pieces at the homes of key devotees and the elderly who cannot go out, and others where they are offered refreshment. During the celebration on June 29th, men or boys named “Pedro” or “Juan” enact St. Peter's awakening St. John, who is so powerful that God has put him to sleep during his day so he would not destroy the world (see song text above); St. John swears that it will not happen the next year. Image of the Holy Spirit (as a child doll like St. John the Baptist - see chapter 2) at the cofradía in Santa María, San Cristobal. Sung for procession and at the altar, not danced. Soloist: the capitana (cofradía head), Amancia Germán Pérez (d. 1977). Master drummer: Nene Pérez (father of Amancia) (d. 1965). The other musical genres, together generically called the sarandunga, are for dance. 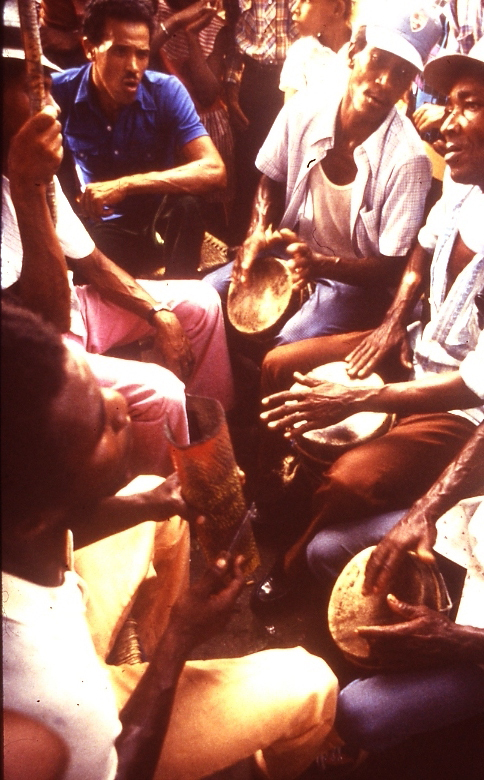 They include the rhythms of the subgenre of sarandunga proper - including "capitana" and many other minor pieces with the same rhythm; the "bomba," and the "jacana." 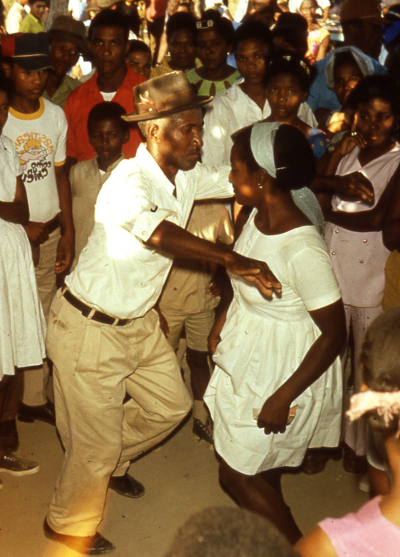 The dance of the sarandunga represents a variant on the drum dance (“baile de palos”) (see chapter 5), the Dominican drum-dance variant which shows the greatest male virtuosity. Here, there is quite a difference between the erect formality of the woman and the energy of the man who, leaning forward with bent waist, changes weight from foot as he flourishes a red handkerchief in a gesture of courtship. The jacana is the slowest and most stately of the sarandunga subgenres, perhaps an heir of colonial dances. In the beliefs, ritual procedures, drumming, and dance of the sarandunga, it is clear that this devotion to St. John the Baptist is an ethnic composite of various ethnic components of Dominican and specifically Baní society.